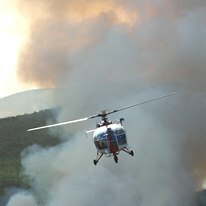 The Southern Cape Fire Protection Association (SCFPA) is situated in the Western Cape and partly in the Eastern Cape. The boundary extends West of the town Heidelberg to the Eastern Cape town of Humansdorp along the coast and as far North as Beauforst west. The SCFPA falls within the Districts of the Garden Route, Central Karoo and Sarah Baartman, and covers the entire jurisdictional areas of local Municipalities, namely Hessequa, Mosselbay, Kannaland, Oudtshoorn, George, Knysna, Bitou, Prince Albert, Laingsburg, Beaufort West, and the Koukamma. It's Southern boundary is the Indian Ocean and the Northern boundary is the Karoo National Park. The SCFPA area covers some 8 million ha. The population within the SCFPA is mainly distributed in and around the major settlements, with the main concentrations being in and around George, Oudtshoorn, Mossel Bay,Knysna, Bitou and Beaufort West . The estimated population within the SCFPA is approximately 686 000 (Census 2016). According to municipal statistics, the sector which provides the most employment opportunities in the SCFPA jurisdiction is the agriculture industry consisting mainly of stock farming as well as fruit orchards. Agricultural growth sectors include vegetables, Hops farming, dairy farming, fruit, livestock, wool, veldflowers, ostriches, aloe and thatch. The forestry sector is a very important component of the economy, and several economic activities are dependant on the South Cape forestry industry. It is estimated that the plantations of the Outeniqua region cover approximately 80 000 ha of land, of which 61 000 ha is in public ownership. MTO Forestry is the largest concern and manages about 50 803 ha of state land.Game Farming is a fast growing industry in the region. Three conservation agencies, namely South African National Parks (SANParks), CapeNature and the Eastern Cape Parks and Tourism Association (ECPTA) manage some of the largest areas of land respectively in the SCFPA, in the form of formal protected areas. SANParks manages large parcels of the Outeniqua and Tsitsikamma mountain ranges, formally under the control of the Department of Water Affairs and Forestry (DWAF), managed indigenous state forests and mountain catchment areas in the Outeniqua and Tsitsikamma Mountains, as well as the established Wilderness National Park, Tsitsikamma National Park, and the Knysna Protected Area (Knysna National Lake Area).The area, located in the coastal strip between the Outeniqua and Tsitsikamma mountains and the sea, contains the Garden Route National Park.The Karoo National Park is situated in the Western Cape, on the southern slopes of the Nuweveld Mountain range in the Great Karoo. CapeNature manages the Outeniqua, Goukamma, Geelkrans, Anysberg, Robberg, Kammanassie, Swartberg, Gamkaberg and Keurboomsrivier nature reserves, which cover an area of approximately 350 000 ha. The ECPTA manages the Baviaanskloof World Heritage Site which covers some 500 000 ha and has 7 of the 8 biomes found in South Africa. The Baviaanskloof is the largest wilderness reserve in South Africa and a large variety of wild animals are found within the reserve. The ECPTA also manages the Formosa Nature Reserve in the Langkloof which is nestled in the Tstsikamma mountains and covers some 5000 ha. Formosa peak is the highest peak at 1675m above sea level. The vegetation of the SCFPA is mostly Fynbos, Karoo shrub and Afro-montane forest. According to Van Wilgen et al (1992) fynbos is fire driven ecosystem and therefore it is dependent on disturbances, which are caused by the natural fire regime in the area. Karoo shrub and Afron-montane forest are considered to be fire-resistant. Veld fires can occur throughout the year, and there is thus no distinct fire season. Veld fires occurring as a result of natural ignitions (generally lightning strikes) occur mostly during the warm, summer months of November to March, associated with high temperatures exceeding 25'C. Some of the most damaging veld fires however, occur in the winter, roughly from May to November and are associated with hot, dry “berg winds” where temperatures can exceed 30'C. These fires are usually started by unnatural ignition sources, such as open fires and arson. The social, economic, and environmental assets exposed to risk of loss to fires in the SCFPA are diverse and include damage to livelihood, properties, and biodiversity. Veld fires have historically, caused significant damage to livelihoods, infrastructure, commercial forestry plantations, agricultural produce, natural resource products e.g veld flowers and biodiversity. The remote mountainous terrain, lack of integrated fire management, co-operation, coordination, and awareness are the most important factors exacerbating the occurrence and damaging effects of veld fires. Since the Knysna Fire of 2017 and the Southern Cape Fires of 2018, large areas within the Outeniqua mountain range have become susceptible to Invasive Alien Plants (IAP) which threaten the water catchment areas and are encroaching on the agricluture and urban interface. The SCFPA is a primary role-player in the Garden Route Environment Forum (GREF) whereby projects are undertaken to mitigate and eradicate the IAP within the SCFPA domain. The SCFPA aims to contribute to community development by eliminating loss of life and human injury in veld fires, progressively reducing impacts on property, job creation and environmental values while promoting the useful role of veld fires as a management tool. It also aims to successfully implement an integrated fire management strategy that will contribute to community development before 2020.